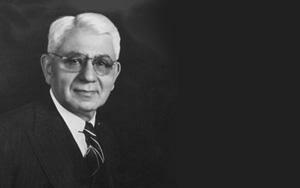 World War I led Armenian American oral surgeon Dr. Varaztad Kazanjian to be regarded as the founder of the modern practice of plastic surgery. Kazanjian was born in Erzinga (Western Armenia) on March 18, 1879. He attended a French Jesuit school in Sepastia (Sivas), and then he moved to Samsun, on the Black Sea shore, to live with his older half-brother. In October 1895, at the age of sixteen, he arrived in the United States as an escapee of the Armenian massacres ordered by Sultan Abdul Hamid II. He settled in Worcester, Massachusetts, and took a job at the local wire factory, where he first displayed the dexterity that would serve him so well in the future. The future surgeon decided to pursue a career in dentistry at the suggestion of a coworker. He continued working during the day, spending his nights taking classes and learning English. He entered the Harvard Dental School in 1902, receiving his D.M.D. degree three years later. Kazanjian began a private practice upon his graduation, and also accepted a position as an Assistant in Prosthetic Dentistry at his alma mater. While working at the Harvard Dental School Clinic, he treated over four hundred jaw fractures and introduced a new method of treatment. He was one of the first to replace the inter-dental splint with a simpler inter-maxillary wiring method. He was married and successfully running his own dental practice in 1914, but when the First World War broke out, he volunteered to join the Harvard Medical Corps, and posted to a huge tented hospital complex in Camiers, France, where he served British forces. There Kazanjian began to treat some of the worst injuries suffered in trench warfare: jaws, noses, cheeks, and skulls shattered by bullets and grenades. After treating more than 3,000 such cases, and reconstructing many disfigured faces, he was celebrated as the “Miracle Man of the Western Front.” Working under primitive conditions in makeshift hospitals, the surgeon’s humane concern, combined with innovative medical procedures, established his reputation and marked his career as a founder of the modern practice of plastic surgery. He was subsequently promoted to the rank of major in June 1916. For his efforts, British King George V invested Kazanjian as a Companion of the Order of St. Michael and St. George in 1919. In the same year, he returned to Boston and accepted a position as Professor of Military Oral Surgery in Harvard Dental School. He completed his medical studies in 1921, when he graduated from Harvard Medical School, and became head of the combined Plastic Surgery Clinic of the Massachusetts Eye and Ear Infirmary and Massachusetts General Hospital. He also served on the staffs of several hospitals. In 1922 he became Professor of Clinical Oral Surgery at Harvard Medical School, a position he held until 1941, when he became the first Professor of Plastic Surgery at the same educational institution. Varaztad Kazanjian’s groundbreaking use of medical technology in eliminating facial deformities and reconstructing faces after injuries was widely lauded during his lifetime. His pioneering contributions transformed plastic surgery into an esteemed surgical specialty. He recorded his unique treatments and methods in one hundred and fifty journal articles, and co-authored the classic The Surgical Treatment of Facial Injuries (1949) with John M. Converse. During the 1950s, Kazanjian received many honors and awards from the American Society of Plastic and Reconstructive Surgery, the American Society of Oral Surgeons, and the American Association of Plastic Surgeons in 1959. Besides being a Fellow of a string of scientific organizations in the United States and Great Britain, he served as president of the American Association of Plastic Surgeons, the American Society of Maxillofacial Surgery, and the New England Society of Plastic and Reconstructive Surgery. He died on October 19, 1974 at the age of 95. Armenian American actress and radio and TV personality Arlene Francis (Kazanjian) was his niece.